The ongoing Islamic insurgency in southern Thailand continues and another nine Buddhists were killed by Islamic jihadists who desire an Islamic state. It is clear that while the insurgency ebbs and flows from many Islamic terrorist attacks to a decrease in activity, that the underlying insurgency remains and just waits to gather pace at any moment. Therefore, Islamic fanatics randomly kill Buddhists, school teachers, Buddhist priests, Muslims who work for institutions in southern Thailand, and members of the armed forces. The level of hatred is clear by the wanton violence and brutality because the Islamic insurgents desire to spread fear in order to reach their Islamic goal. This goal applies to the complete Islamization of southern Thailand and the eradication of all Buddhists and Buddhist temples from the region of Narathiwat, Yala and Pattani. In the past you had nationalistic sentiments to the insurgency because Thailand annexed the three Muslim provinces in 1902. However, while you had radical Islamic elements prior to 2001 it is clear that the insurgency had mainly nationalistic tones and the insurgents focused on the government and military of Thailand. This policy changed from 2001 because now it became apparent that Islamic radicalization had taken root because of outside meddling and the role of Islamic institutions in other nations which were spreading the doctrine of Islamic jihad. Therefore, it now became open season for Muslim insurgents to kill Buddhists in southern Thailand and to kill Muslims who were deemed to be supporting the government of Thailand or supporting the status quo. Since 2004 you have had over 4,300 lives lost in a brutal Islamic insurgency whereby Buddhist priests have been beheaded, children have been killed, and civilians are attacked in order to create a southern Thailand where no Buddhists remain. Moderate Muslim religious leaders also face death and the same applies to anyone who is deemed to be collaborating with the government of Thailand. Zachary Abuza, who is the author of A Conspiracy of Silence, highlights the complete hatred of pamphlets which are used in order to intimidate the local Buddhist community. Turning back to the role of radical Islamic madrasas, then it is clear that Islamists are being churned out of many Islamic institutions and this is causing mayhem. If national governments do not regulate these schools and maintain tight supervision or if an alternative system is not found, then little will change apart from more Islamic indoctrination and international jihadists. Therefore, the continuing breeding ground of Islamic hatred must be stopped and checked. This applies to radical organizations and madrasas which are intent on spreading this hatred and radical institutions can be found throughout the Muslim world and in democratic societies which are sleepwalking into an Islamic nightmare. B. Raman (Additional Secretary (retd), Cabinet Secretariat, Govt. of India, New Delhi) comments about the role of Thai Muslims within the Islamic jihadist movement and the role of the Islamic madrasas. 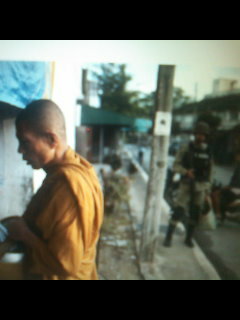 In the first few weeks of January in 2011 you have had nine Buddhists being killed by Islamic terrorists and in a separate attack four members of the armed forces of Thailand were killed. Therefore, the Islamic insurgency continues to kill and spread fear in southern Thailand and many Buddhists have left in order to escape the ongoing Islamic insurgency. It is clear that Islamists in southern Thailand desire a homeland whereby all Buddhists will be cleansed and then Islamic Sharia law will hold sway. At the same time it is abundantly clear that Islamic indoctrination from outside of Thailand is a serious issue and the same applies to the international nature of the global Islamic jihad. Therefore, the government of Thailand faces both an internal threat and the reality that external networks are fueling the fire. Islamic terrorism once more strikes fresh fear in the Russian Federation after 35 people are killed and hundreds are injured. The attack took place at Moscow’s busiest airport and the bloodbath which took place is a clear reminder about the threat of Islamic jihadists in the Russian Federation. Therefore, renewed security will be called for and more clashes will erupt in the volatile North Caucasus region where Islamists are bent on creating an Islamic state and carving up the Russian Federation. At the moment all fingers point to Islamic terrorists who operate in the North Caucasus region because you have had many Islamic attacks by jihadists in the past both within the North Caucasus and throughout the Russian Federation. Therefore, while the investigation is still ongoing it is clear that many will suspect that the Islamic suicide mission will have been formulated within the North Caucasus or through networks which have links to this region. It is clear that outside forces have given and continue to give economic support to Islamists in the North Caucasus region. Therefore, you have many “rat lines” and this applies to Islamic networks in several nations, Islamic charities which are intent on spreading Sunni Islamic extremism, Islamic criminality via the narcotic trade, and other areas. It is clear that ethnic nationalism is potent in the North Caucasus and outside Islamists have fermented hatred in order to Islamize the region. The Palestinian cause, just like that of Muslims in southern Thailand, was mainly based on nationalism than Islam in the past. However, Islamic charities, funding from outside nations, Islamic propaganda, radical Muslim religious leaders, and other ways of spreading the Islamic agenda; have changed the causes of Chechnya, Dagestan, southern Thailand, and other parts of the world into a battleground where Islamic jihadists desire complete Islamization. The latest terrorist attack in Moscow is a permanent reminder that the North Caucasus region is blighted by Islamic terrorism and that jihadists can attack anywhere throughout the Russian Federation. In January 2011 you have had attacks in Chechnya, Dagestan, Ingushetia, and Kabardino-Balkaria. 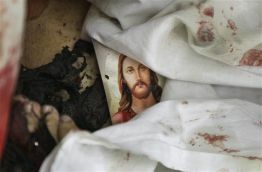 At the same time Christian churches have been attacked in recent times by Islamists and moderate Muslims or alternative voices also face death. Therefore, Aslan Tsipinov was killed in Kabardino-Balkaria-Karachai by Islamists because he was deemed to be an “idolator” (mushrik) and it is clear that Islamists are intent on enforcing Islamic Sharia law and ruling by fear. The latest terrorist attack highlights the ongoing threat of Islamic terrorism in the Russian Federation and it is clear that internal Islamic organization and external Islamic organizations are working in tandem. Terrorist networks have also been developed between Islamic networks within the North Caucasus and with international terrorists who have an Islamic agenda and who seek to spread Islam by the sword and through Islamic indoctrination. At the same time you have an ethnic angle and an inner struggle between different branches of Islam in the North Caucasus and this applies to indigenous Islam versus Wahhabi inspired Islam. Therefore, many moderate Muslim leaders, like Nurmagomed Gadzhimagomedov who was killed in Dagestan, have been killed by Islamic radicals. Overall, it is clear that you have major problems in the North Caucasus and this instability is infringing on other parts of the Russian Federation. At the same time you have Islamists who dream of creating either an Islamic caliphate or independent Islamic states. Therefore, internal and external Islamic forces will continue to challenge the central state and moderate Muslims will also face the wrath of radical Sunni Islam in the North Caucasus. 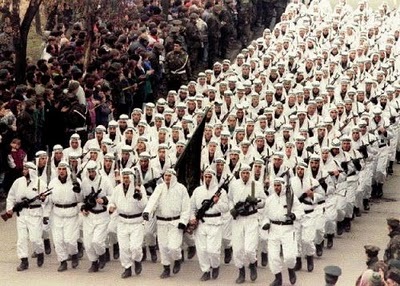 The hidden “Islamic jihad” and dimensions of Bosnia have been ignored prior to the conflict, during the civil war in the early 1990s, and afterwards. This misrepresentation of reality meant that thousands of Islamists from all over the world were aided by so-called democratic powers and the role of the mass media and many leading academics served the ambitions of Al-Qa’ida and other outside powers. Therefore, what is the reality of Bosnia and why is it claimed that all communities resided in peace and tranquility? According to many naïve Western commentators Bosnia was a tranquil reality where Muslims and Christians lived happily together for many centuries. Not only this, the Western rhetoric claimed that in modern times it was the Muslim leadership in Bosnia which was open-minded, democratic, modernist, and which desired to maintain a multi-cultural and multi-religious society. The truth could not have been further and Western commentators and academics are clearly glossing over reality because the Ottoman Empire was not based on enlightenment. On the contrary, the Islamization of Bosnia was paid by the blood of Christians and the slavery and forced conversions of young Christian boys who were forcibly converted to Islam via the barbaric devshirme system. The Christians of Bosnia clearly faced pogroms, institutional discrimination, and a system which was brutal. If Christian men happened to fall in love with Muslim women then they faced the death penalty because it is forbidden in Islam, however, countless numbers of Christian women were taken by Muslims, just like in modern day Egypt and Pakistan, and the legal authorities deemed this permissible. In fact the myth of peaceful Islam in Bosnia could not be further from the truth because conditions for Christians in Bosnia was especially brutal because the landed elites who were Muslim, ruled over their Christian subjects with disdain. The Western hype of multi-cultural Bosnia is just that and in the middle of the 19th century you had around one hundred mosques in Sarajevo but only one Orthodox Christian church. Non-Muslims suffered the fate of being dhimmis and converts to Islam used their power in order to maintain a system which supported every indignity that you could imagine. It was a policy based on the “superior Muslims” against the “enslaved Christians” and if the Christians did not accept dhimmitude, paying heavy taxes via jizya, and allowing young Christian boys to be converted to Islam and taken away to Istanbul, then the Islamic sword awaited them. World War Two also witnessed the mutual support of the Muslim elites with Nazi Germany and Orthodox Christians faced the brutality of many forces. This notably applies to the Croatian Catholic Ustasha regime which was genocidal towards the Serbian Orthodox Christians and it must be stated that Muslims participated fully within the military wing and police force of this brutal and barbaric regime. At the same time Muslims served under the Nazi regime of Germany and the 13th Volunteer Mountain Division of the Waffen-SS (Handschar) was famous for killing Orthodox Christians. Again, it must be remembered that this Bosnia is the same Bosnia that Western journalists and academics claimed was peaceful and based on religious and ethnic toleration. It would appear that these journalists and academics deem the control of land in the hands of Muslims; converting Christian boys to Islam by the barbaric devshirme system; killing Christian males for marrying Muslim women; no rights under law during cases involving Christians and Muslims; a brutal jizya tax system; the mass inequality of the dhimmitude system; and the fact that Muslims joined forces with both the Ustasha fascist regime and the Nazi SS; somehow, all this in the eyes of Western academics and journalists meant ethnic and religious bliss. If the same journalists and academics had vindicated Western European and Arab slavery of Africans in Africa then the mass media would have ridiculed such disgraceful notions of history. However, the same mantra was used in order to vindicate the Muslim side in Bosnia during the 1990s. The communist interlude in Yugoslavia certainly contained Islamists in Bosnia but Muslim elites like Alija Izetbegovic were waiting in the wings and his pan-Islamic dreams for the Islamization of Bosnia and then further afield remained strong. However, when the conflict broke out in 1992 the media in the West remained silent about this and other future crimes by both Bosnian Islamists and international Islamic jihadists who glorified in beheading Orthodox Christians and spreading a new Islamic jihad. The hidden “Islamic jihad” in Bosnia was covered up because this suited the needs of interested parties and it was not productive to show America, Alija Izetbegovic, Al-Qa’ida, the global jihadist network, and other nations, working hand in hand. Therefore, the “Muslim victim card” was played and the same applies to re-writing history. The Serbians, who had been the victims of Islamic jihad under the Ottomans and then suffered so brutally under the Ustasha/Nazi/Islamic collaboration during World War Two, were once more victims, just like they had been under the Habsburg Empire, because during the 1990s it is clear that the mass media sided with all anti-Serbian forces. This applies to supporting Croatia, the Muslims of Bosnia, and the Albanian Muslims of Kosovo. However, for Muslim elites the Bosnian conflict provided an opportunity and Alija Izetbegovic who had ties with the Muslim Brotherhood in Egypt and who openly admired Ayatollah Khomeini, saw an opening for Islam in Bosnia and his pan-Islamism meant that he ignored the Sunni-Shi divide. Therefore, we have a whitewash of past history and how the Serbian Orthodox Christians suffered during the Ottoman Empire. This applies to the brutality of the devshirme system, dhimmitude, pogroms, and the enslavement of Christians. The reality of history is being reduced in order to meet current political trends and this collective amnesia also applies to the Muslims supporting both Croatian fascists and the Nazi Party during World War Two. Turning to events in the 1990s it is clear that Alija Izetbegovic had an Islamic vision for Bosnia and he also spoke about the need to support all Muslims throughout the former Yugoslavia. At the same time he was welcomed with open arms by Iran and he had links with the Muslim Brotherhood. However, this meant nothing to Bill Clinton and Al-Qa’ida was given a free-reign in Bosnia by America and other forces which had vested interests. Just like the mass media and academics had falsified history they were now ignoring the reality of Bosnia. Islamic jihadists were given the “green light” alongside terrorist networks and thousands entered Bosnia with the complicity of the Bosnian Muslim government and agencies which were serving Bill Clinton. Therefore, the beheadings of Orthodox Christians were not shown on television, nor were images of thousands of Islamists who were killing in the name of Allah and of course the real underdogs were the Bosnian Serbs because they were fighting Bosnian Muslims, Croatians, Islamic jihadists, and covert military support and training from Western nations who were involved in murky dealings with nations like Iran, Saudi Arabia, Pakistan, and a host of other nations. The Islamic agenda of Izetbegovic before the war was ignored and then during the war the mass media and academics, alongside political leaders, all developed collective amnesia. Memories of history remained strong but somehow the Orthodox Christians of Bosnia were meant to welcome their future “dhimmi” status if Izetbegovic’s dreams were to come true. 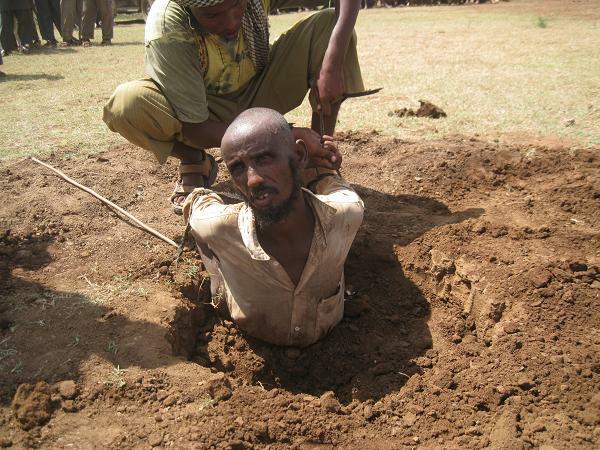 El-Mujahid fighters in Bosnia and other Islamists enjoyed torturing Christian captives and beheading them and then sending these images to the internet. Just like Islamists have done after capturing Americans and other nationals in Iraq and other parts of the world. However, for Bill Clinton and the Western media this did not concern them because they had to highlight the “Muslim victim card.” Yet the same Americans who were disgusted when Muslim jihadists did this to their nationals in Iraq did not know that their own American government tolerated this during the war in Bosnia. Izetbegovic stated that “He who rises against Islam will reap nothing but hate and resistance” and the Bosnian Orthodox Christians new full well that he was not interested in sharing power or a democratic nation which was based on pluralism. On the contrary Izetbegovic was warning the Christians to accept dhimmitude and Islamization. At the same time he welcomed support from the Muslim Brotherhood, international Islamists, Al-Qa’ida, Iran, Pakistan, Saudi Arabia and Islamic channels via Sudan and other nations. It is clear that Muslim demographic factors will continue to alter the landscape of parts of the Balkans and alongside this will be major investments from Islamic nations which desire to spread and create Islamic states in Europe. Added to this are Islamic terrorist cells and individuals who were welcomed into Bosnia and Kosovo by local Muslim elites and by policy makers in Washington during the conflicts of Bosnia and Kosovo. Policy makers in Washington now have a different agenda but more recent terrorist activity is evidence that the international Islamists have spread their ideology alongside Muslim elites in Bosnia who had an Islamic agenda. The “Muslim victim card” is still being used and this needs to be challenged because the conflict in Bosnia was complex and the Bosnian Serb leadership faced a “hidden Islamic war” and a “covert war,” whereby international players openly manipulated the situation on the ground. The events of Bosnia and the role of Izetbegovic and radical Islam did not fit the Western agenda and for multi-cultural media outlets which desired to maintain the “Muslim victim card myth” it suited their quaint upbringings. Therefore, while the Serbians were being demonized the international Islamic brigade was slitting the throats of Orthodox Christians and they clearly had the blessing of Izetbegovic. The ramifications of Bosnia continues and this applies to Islamic terrorist cells; Islamization funding projects by Bosnian Muslim elites alongside funding from Saudi Arabia and other Islamic nations; demographic factors; the “Muslim victim card” in order to radicalize Muslim youths; and other factors. However, despite everything it appears that America is still intent on a unified Bosnia whereby a Christian majority will be ruled by Muslim elites. Maybe the leadership in America could point to a nation where non-Muslims welcomed being ruled by Muslims and what happened once they became ruled by Islamic Sharia law? It is clear that the Bosnian Serbs cannot trust the international community because of past deeds and the ongoing reality of Kosovo where Orthodox Christians reside in fear and in the knowledge that many Orthodox Christian churches and monasteries have been destroyed. The past reality of Islam in Bosnia means that you have no history of mutual co-existence because dhimmitude, jizya, pogroms, and the devshirme system was brutal. Therefore, you had a Muslim landed elite and an Orthodox Christian peasantry which was taxed heavily in order to maintain Islamic power and control. Overall, the distortions of past history and events during the war is one of international shame because the media bias was not only extreme, it was dangerous. Therefore, Islamists within the Bosnian elites were given a power base and they increased their power base by blocking any compromise and allowing thousands of Islamists from all over the world to enter Bosnia. Today global Islamists and the followers of Izetbegovic are still dreaming about an Islamic state and Saudi funding and other policies are intent on changing the Balkans. Islamists also hope to use the demographic factor in order to achieve this. Therefore, the Bosnian Serbs need either an independent nation state or to be allowed a referendum in order to join Serbia. If not, the Serbs face another de-Orthodox Christianization reality and this factuality can be seen in modern day Kosovo where their culture, churches, and community is under constant threat. The rich history of Orthodox Christianity in Kosovo faces a bleak future and one of little hope. If the Bosnian Serbs continue to wait or are forced by the international community to accept Bosnian centralization then surely the same fate awaits them and this applies to Islamization.